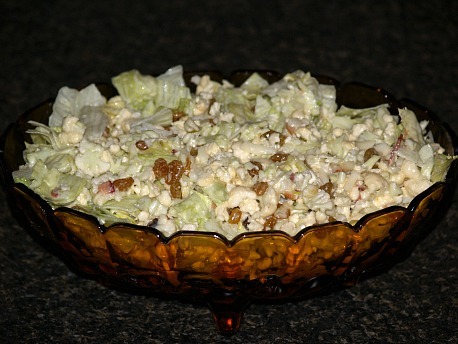 When I learned how to make a cauliflower salad recipe I found it is delicious with the added flavor of bacon or many other flavorful ingredients. Because of its mild taste it can easily be blended with many ingredients and other vegetables. It also goes well with a creamy dressing or one with an oil and vinegar base. Many different spices can be added to give zest and flavor. Cauliflower is grown in many colors like orange, green and purple, and white. ; each offering a variety of health benefits. White cauliflower is the most common around here and the only one that I cook with. It is very good and makes a very pretty presentation when mashed or in salads. I learned how to make a cauliflower salad recipe for Christmas; it is good all year but it makes a very nice red and green presentation for Christmas and so easy to make. Combine all ingredients and toss to coat; refrigerate until serving. In a large bowl put the lettuce, onion, bacon and cauliflower. Mix together the mayonnaise and sugar. Blend thoroughly the mayonnaise mixture into the cauliflower and lettuce mixture. Top with the cheese. Cover and refrigerate overnight. 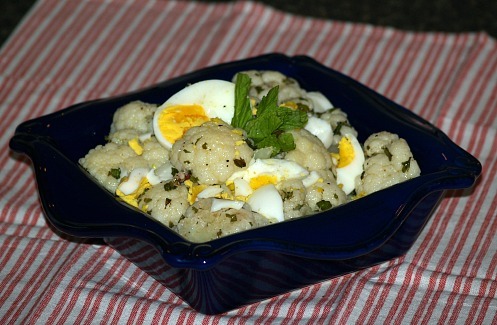 If you are learning how to make a cauliflower salad recipe the following recipe is a bit different. The flavor of mint in the dressing makes it unique and quite delicious. Place hot steamed cauliflower in a bowl or container with a lid. Combine the mint leaves, oil, vinegar, garlic, salt and pepper; Whisk together to blend. Pour mixture over the cauliflower, cover with lid and refrigerate for a few hours. Chop boiled eggs on top and serve as a main salad or serve in a small bowl as a side salad. Combine all vegetables and toss to mix. Combine mayonnaise, sour cream, sugar, salt and pepper; mix to blend. Blend creamed mixture in the vegetables and toss to coat. NOTE: If you like dryer salads, you may not want all the creamed dressing on the vegetables. Blanch broccoli, cauliflower and carrots separately in boiling water; plunge in cold water to cool quickly and drain thoroughly. Marinate blanched vegetables in Italian dressing overnight. Drain vegetables from Italian dressing and combine with tomatoes and artichokes. In a mixing bowl combine mayonnaise, chili sauce, lemon juice, dill cumin and minced garlic. Add dressing to vegetable mixture and toss to blend; refrigerate until serving. Cut bacon into small pieces and fry until crisp; drain on paper towels. Sauté the onion in the bacon fat until golden brown. Combine sugar, flour, salt and pepper; stir into bacon fat. Gradually add vinegar to mixture and cook slowly until thickened stirring constantly. Add the bacon to the sauce and heat until hot. Combine cabbage and cauliflower; pour hot bacon mixture over cabbage and cauliflower. Toss mixture to coat and serve immediately.